According to the USDA – National Agricultural Statistics Service, Illinois corn harvest progress (estimated to be 74 percent complete) as of October 27th has been slower in 2013 than in 2012, but is six percentage points ahead of the 5-year average. 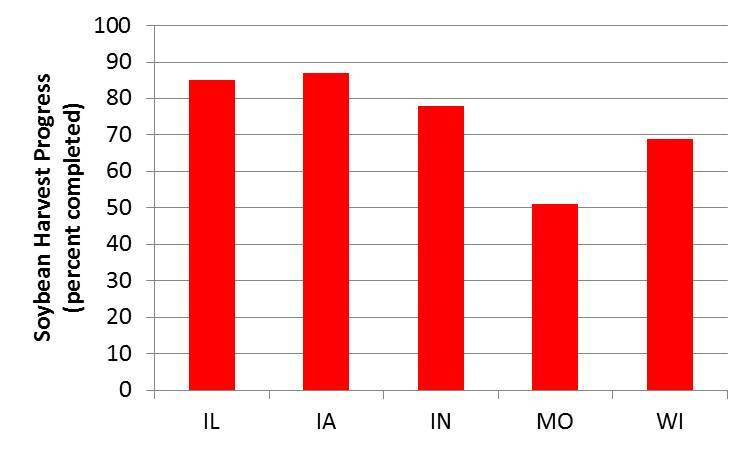 Comparing Illinois corn harvest progress to adjacent states, Illinois is 15 to 35 percentage points ahead of Iowa, Indiana and Wisconsin and is 4 percentage points behind Missouri (Figure). In the Western Illinois Crop Reporting District, an estimated 64 percent of the corn acres have been harvested, trailing seven of the eight other crop reporting districts. Corn harvest is complete at the Northwestern Illinois Agricultural Research and Demonstration Center (NWIARDC). 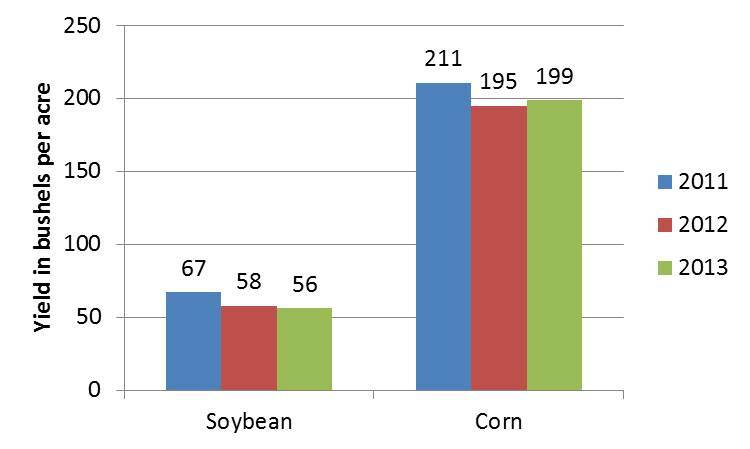 Corn yield averaged 199 bushels per acre, 2 percent or 4 bushels per acre more than in 2012. Corn yield was 5 percent or 12 bushels per acre less than in 2011 (Figure). One can speculate about whether, despite the dry soil conditions throughout much of the growing season, the below average temperatures may have helped pollination success. Illinois soybean harvest progress (estimated to be 85 percent complete) as of October 27th is similar to in 2012 and 7 percentage points ahead of the 5-year average. 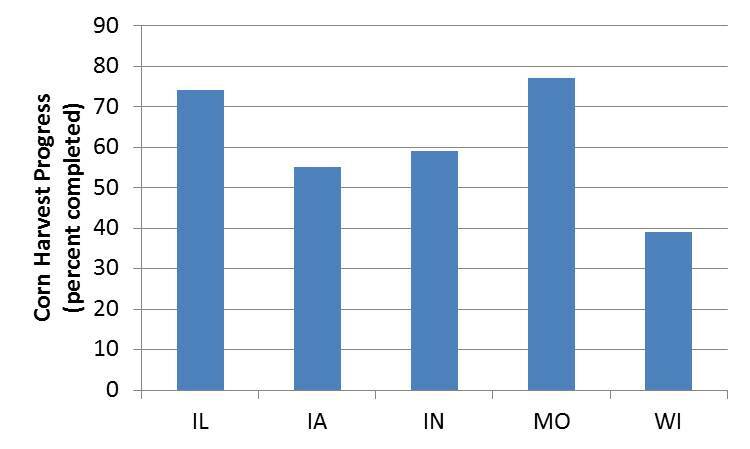 Comparing Illinois corn harvest progress to adjacent states, Illinois is 7 to 34 percentage points ahead of Indiana, Missouri, and Wisconsin and is 2 percentage points behind Iowa (Figure). In the Western Illinois Crop Reporting District, an estimated 75 percent of soybean acres have been harvested. Similar to corn acres, soybean harvest progress in this crop reporting district trails all but one of the other eight districts. Soybean harvest is complete at the NWIARDC. Soybean yield averaged 56 bushels per acre, more than 3 percent (2 bu/A) less than in 2012 and 16 percent (11 bu/A) less than in 2011 (Figure). One can speculate about whether the later than optimal planting dates, the dry soil conditions or a combination of the two depressed soybean yields.